Here you wil find some basic information on burglary safes. To see what	safes we have in stock, please navigate to the main Safe Products page	to view our in-stock safe gallery! 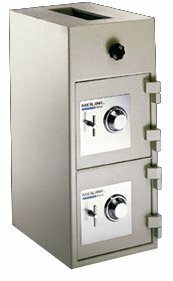 Burglary safes are designed to prevent forcible entry into the locked container. 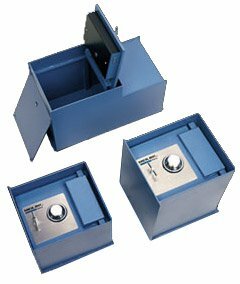 These safes come in many different configurations to meet varying needs	of the end user that can be divided into two major categories-In floor	and free standing. An in floor safe would be one that is actually installed	down into an opening in the floor and is flush with the top of the floor. 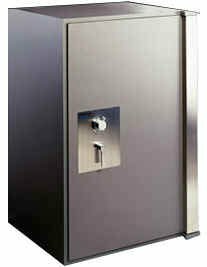 A freestanding safe is one that sits on the floor or mounted in a cabinet. In times past the in floor models were the safe of choice however most	safes in use today are of the free standing style. Burglary safes are available in many different levels of security to match	your needs. If you just need something to “keep the honest people	honest” then a simple locking light duty safe will suffice. If you	are a dealer in diamonds or rare collectables then consider something	more substantial to protect your investments. A good place to start is	to evaluate what you are planning to put in the safe and contact your	insurance agent and see if there are any recommendations or requirements	for safeguarding your contents. For more details on what is available click on the appropriate link for	the type of safe you are interested in. Provide your contact information below and a short message and one of our staff will get back to you as soon as possible! We carry a large selection of keys, locks, safes and more! We offer services for commercial, residential and automotive. Call our team today to ask a question or schedule a service. Located at 10345 SW Canyon Rd.